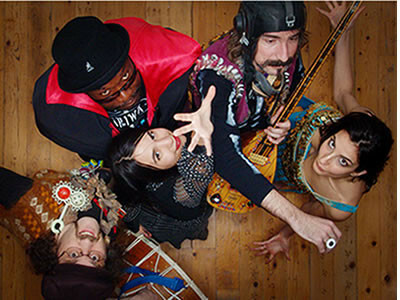 Known for its unique sound created by the amalgamation of natural field recordings coupled with traditional and modern acoustic and electronic instruments, Baba Zula, an adventurous underground band, based in Ýstanbul has brought a brand new dimension to the alternative world music scene. Scoring solely for plays and films until their first vocal album "Psychebelly Dance Music", Baba Zula remains loyal to its singular creativity. Mixed and mastered by Mad Professor, the notorious British/Jamaican dub producer, the "oriental-dub" album incorporates folk tunes, gazel, taksim and bozlak with a contemporary approach and fuses them with universal concepts such as sample, dub and groove. With their third album, "Duble Oryantal" again mixed and mastered in the heart of mega-city Istanbul by Mad Professor, Baba Zula have further developed the new genre they have named 'oriental dub'. There's a talented and eclectic supporting cast on board for a share of musical pioneering. Guest musicians include reggae legends Sly Dunbar and Robbie Shakespeare, Alexander Hacke - bassist of Einsturzende Neubauten, Canadian vocalist Brenna MacCrimmon and three acclaimed artists who span the spectrum from traditional Turkish music (celebrated clarinetist Hüsnü Þenlendirici from Laço Tayfa) to Turkish rock and pop (Özkan Uður from MFÖ), and writer-painter-musician Mehmet Güreli. Founded in Istanbul in 1996, Baba Zula feautures founding members Levent Akman (percussion, rhythm machines,toys), Murat Ertel (saz and other strings,vocal), as well as darbuka player Coşar Kamçı who replaced original member Emre Onel in 2005. BaBa Zula added live drawing artist Ceren Oykut into the mix in 2004. Her presence onstage has added an important visual aspect to BaBa Zula’s live performances. Baba Zula go to great lengths to provide their fans with a unique live show experience. Their ritual like performances are a mixture of disciplines of art, often featuring belly dancers, elaborate costumes, poetry, theatre and live animation, delivering viewers a tantalizing audio-visual feast. By mixing oriental instruments such as the darbuka, electric saz, and spoons with electronics and modern sounds, BaBa Zula creates a sound all their own called "Oriental Dub". While a ney can represent the past Sufi-Islamic tradition, and a clarinet is the symbol of the music of the Turkish gypsies-an electric saz together with a wooden spoon can serve as musical compass to Turkish musical roots going as far back as pre-Islamic, shamanic times, through Anatolia reaches all the way up to present-day Istanbul. Despite sounds that might initially come to mind when one hears the phrase "Oriental Dub", Baba Zula’s music is in fact rock’n roll that rolls in a way that westerners haven’t heard since the late ’60s rock epoch. Baba Zula share their legacy with us through their music, a music born out of Istanbul and influenced by the memories of Istanbul passed on to them from generations past. The group, which from the very beginning has shown great interest in featuring guest musicians and players in concerts and albums, has been accompanied by stars such as the Thracian Selim Sesler (clarinet master), the Canadian singer Brenna MacCrimmon (specialized in Balkan folk music), Alexander Hacke (E.N. ), Fred Frith (from Henry Cow, John Zorn, etc), Jaki Liebezeit (Can), Hüsnü Şenlendirici (Clarinet master from "Laço Tayfa"), Ralph Carney from San Fransisco (saxophonist who worked with Tom Waits and B52’s) and the diva Semiha Berksoy (first Turkish opera singer and painter). Baba Zula’s debut album, "Tabutta Rovasata = Sommersault in the Coffin" (re-released by Kadraj in 2006) includes the original music score for Dervis Zaim’s first movie of the same name released in 1996 about a car thief who returns the cars he has stolen to their original owners and falls in love with a peacock. The album also includes four songs on which the movie’s stars Ahmet Ugurlu, Tuncel Kurtiz and Aysel Aydemir contribute vocals. Their album, "Three Plays from Seventeen pieces" (Doublemoon Records ) comprising music created for the plays "The Little Prince" by Antoine de Saint Exupery, "Frog Tales" by Arnold Lobel and "Kitchen Accidents" by Perihan Mağden, was released in 1999. Apart from a number of other artists,Ralph Carney, Brenna McCrimmon and Selim Sesler have also taken part in this album as guest stars. Baba Zula has also made the music for the film "Renkli Türkçe = Colored and in Turkish", directed by Ahmet Cadırcı. Their third album "Psychebelly Dance Music released in May 2003 was mixed and mastered by the British musician and producer Mad Professor who previously worked with Massive Attack , The Orb, Lee Perry and the like. and Alexander Hacke and reflects the culmination of years of fearless musical adventuring, and as usual there’s a talented and eclectic supporting cast on board for a share of the bounty. On 2007 release, "Roots", Baba Zula return to their original format as a trio and only the core members of the BaBa Zula family, such as vocalist Brenna MacCrimmon, can be heard on only one song. The group also show off a new perspective on their trademark sound "oriental dub" courtesy of the group’s first trip to Japan in the Spring of 2007, where they befriended a Japanese sound engineer. Traditional Turkish influences on the album include works by important composers and lyricists in the history of Turkish music, such as Neşet Ertaş and Pir Sultan Abdal as well as analog recording techniques courtesy of Turkish producer Mehmet Ateş. Baba Zula have composed several mood-setting pieces for the silver screen over the years, their most recent release is an original score for the film "Dondurman Gaymak". The band also appeared in the Golden Bear award winning director fatih akın’s film "Crossing the Bridge" that explores the sounds of Istanbul. The group also provided music for the film by recording with Einstuerzende Neubauten’s Alexander Hacke. Baba Zula have turned up the volume and energy levels at festivals such as the Roskilde Festival (Denmark), Sofia Film Festival (Bulgaria), Klinkende Munt Festival (Belgium), Arezzo Wave Festival (Italy), Images of Middle East (multi-city Denmark tour), Cologne Triennale (Germany), Printemps de Bourges (France), Şimdi/Now Festival (Germany), the Boost Festival ( Netherlands) and the Venice Biennial.